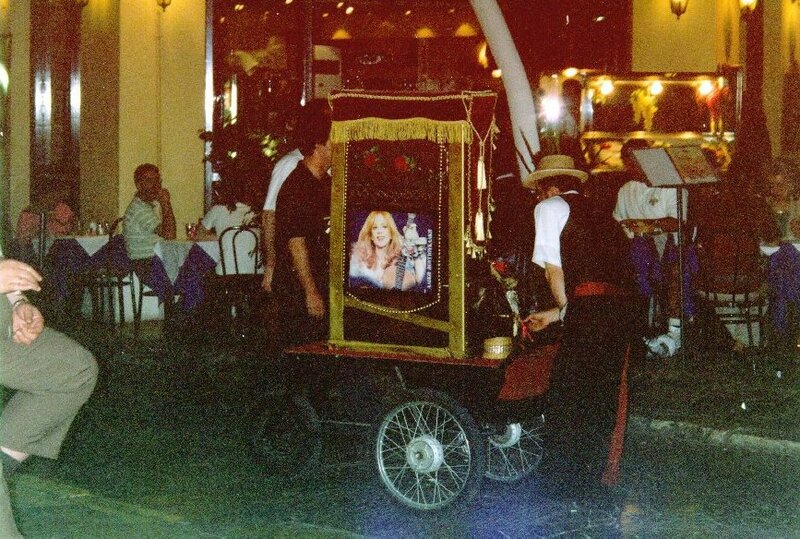 Recently I was enjoying an ouzo in the Plaka in Athens, Greece when an old man passed by pushing an organ grinder-like instrument on a push cart. As he turned the crank, the instrument made beautiful, bazuki music with an occasional ding from a bell. It was not an organ and did not sound like a barrel piano; it made a mandolin or bazuki sound. On the left side were two bars which he manipulated to change tunes. On the front was a glass heart with a picture of a girl. At the bottom, it said, "FSA. CARMELO" (I'm not sure of the "R") and then "Constantinopoli." The later refers to the city now known as Istanbul. 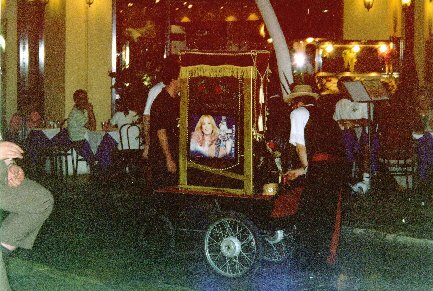 I followed him for several blocks, after paying for my ouzo of course, and enjoyed the lovely music. I tried to speak with him but he spoke no English. 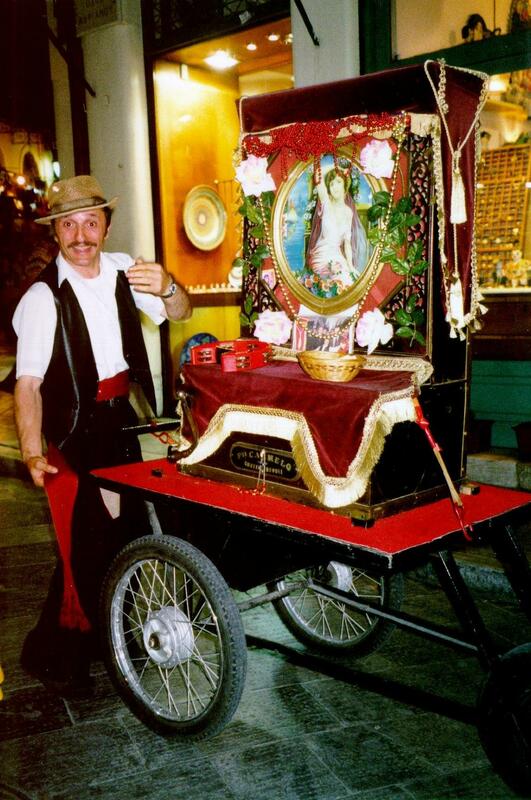 I found a shopkeeper who seemed to know the man and he said there were only 5 or 6 of these instruments in all of Greece and that only one man, who is now 85 years old, services the instrument. Does anyone know what the instrument is and anything about the history? P.S. : I only had one ouzo so I believe my account is reasonably accurate! The instrument that Gerry Bay encountered in Athens, that he described in MMD 980712, is a Greek barrel piano called a 'laterna'. They were manufactured in Constantinople (Istanbul) in the late 19th & early 20th century. Some instruments were imported from Italy. 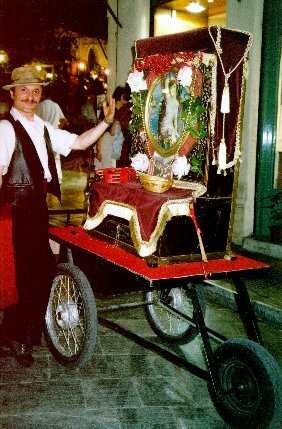 They were played by street entertainers in cities in Greece and western Turkey, often accompanied by a second person playing a rhythmic accompaniment on a "defi" (tambourine). 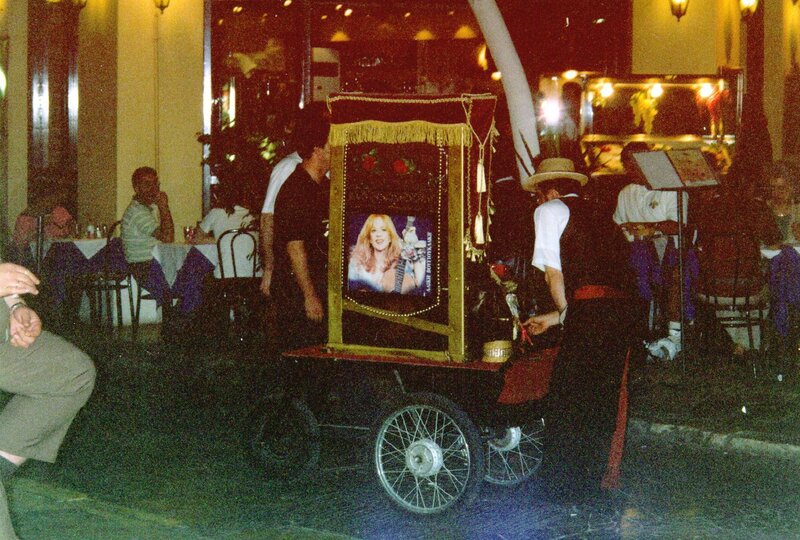 Melina Mercouri plays a laterna briefly in the film, "Never on a Sunday." 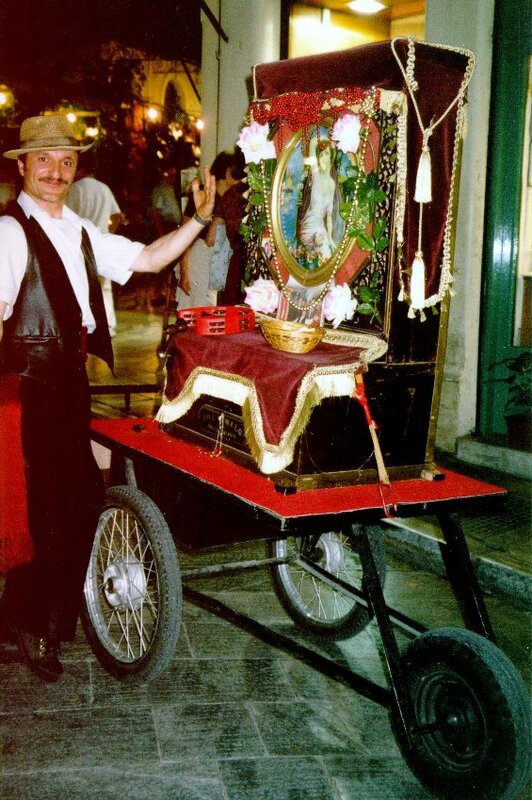 The last remaining repairman is Nikos Armaos. Born in Constantinople in 1890, he settled in Pireaus in 1923; he also made up the pinned cylinders for the instruments. There was an article on a laterna: "A Turkish Street Barrel Piano" by Joeseph Schumacher in the Spring 1996 issue of the Journal of Mechanical Music. It had an old typed note on the instrument explaining what it was, how old it was (mid 1800s), and (interestingly) that "the last person" who could service it recently passed away (maybe the shopkeeper you spoke to hasn't kept up on current events lately, or maybe this is all urban legend). The note claims that it was very rare (but of course!) it's been restored (that might mean dusted off, who knows? ), and she even let me turn the crank and play it, but it sounded terrible to my ears. I just figured that it was a cultural sound, and might be music to somebody else's ears. Either that, or I wasn't turning the crank at the right speed.